“All those hours poured into our project, all that hard work is judged within a space of seconds, within a few hours,” said one contestant. For most competitors, the race itself takes just over or under one second, to be precise. And at F1 in Schools competitions, precision is the name of the game. F1 in Schools uses meticulously crafted miniature racing cars as vehicles for helping students hone skills in science, technology, engineering, math, business, marketing, and management. But Nikos stuck with it. In 2015, he was captain of Team Reset. The competition encourages participants to build business savvy in pitching their project to sponsors to raise funds. When Team Reset reached the fundraising stage of the competition, they reached out to the Stavros Niarchos Foundation, and the Foundation’s Co-President, Andreas Dracopoulos, met personally with Nikos. “To be able to offer young people the opportunity and the means to create, to innovate, to explore their talents and ultimately to excel is so important,” said SNF Program Officer Aristi Stathakopoulou. 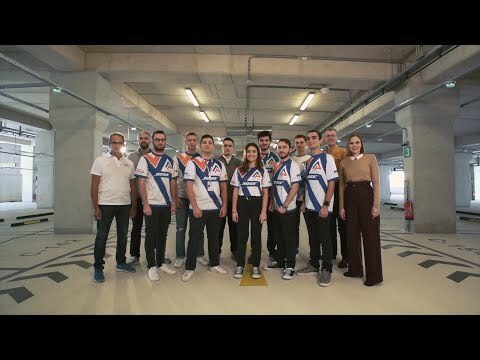 The Stavros Niarchos Foundation’s ongoing support for F1 in Schools in Greece since then reflects three important ways in which the program’s goals dovetail with the Foundation’s mission. Though centered on a physics-intensive final product, the competition aims to inculcate a much broader set of skills. Team members also need to develop a business plan, create a team brand and marketing strategy, cultivate sponsorship, manage a budget, master design software, construct a car, and plan a rigorous testing process. Each member has a defined role on the team, but all need to collaborate at each of these stages. These other skills are not mere afterthoughts to how the car performs in races—teams are also judged on a display of their team brand, a verbal presentation overviewing the whole process, and a 20-page written report. “These students reached goals that even professionals have a hard time reaching,” said F1 in Schools Greece organizer Dimitris Polimatidis of the complex and interrelated tasks that must be mastered to advance in the competition. F1 in Schools is structured to extend the impact of outside support in another way that resonates with SNF’s goals. SNF focuses on the long-term sustainability of projects. By asking teams to raise funds as an integral part of the competition, resources are more widely distributed and students gain lasting skills and experience. SNF supported teams at 25 public school in Greece last year to encourage participation, but so as not to remove a key element of the competition, each team had to raise additional funds. Give a man the resources to build a tiny F1 car and he’ll race for a day. Teach a man to gain sponsors for his F1 car and he’s gained business savvy for life. Formula 1 might seem like an odd thematic candidate for an educational program that aims to reach a broad group of young people. F1 racing is decidedly not an amateur pursuit, nor one designed for young people, and it requires intensive inputs of equipment, manpower, and capital. The beauty of F1 in Schools is that students, most of whom cannot drive a car, are still pulled into the excitement of the race and the extensive teamwork and technical knowledge it requires. SNF supports organizations working to increase access to knowledge and resources, and F1 in Schools makes some of the most valuable elements of an elite sport accessible to a broad population. And the competition has clearly inspired excitement and dedication in its broad following. “To dedicate months of work and, if needed, stay up late into the night, you need to love what you are doing,” said Christos Gagas, a member of NewGen Tachytis, one of the teams supported by SNF. This year, two of the Greek teams supported by SNF placed in the top ten at the World Finals in Singapore. Though his racing days are over, Nikos Samaras remains as involved as ever in the F1 in Schools community as a mentor to young participants and a judge. He’s now at university pursuing an engineering degree.